An authentic seagoing instrument, this aptly named model is distinguished by its broad ratcheted bezel featuring a highly professional style including black rubber- incrusted numerals and markings; as well as by its oversized twin day-date windows. 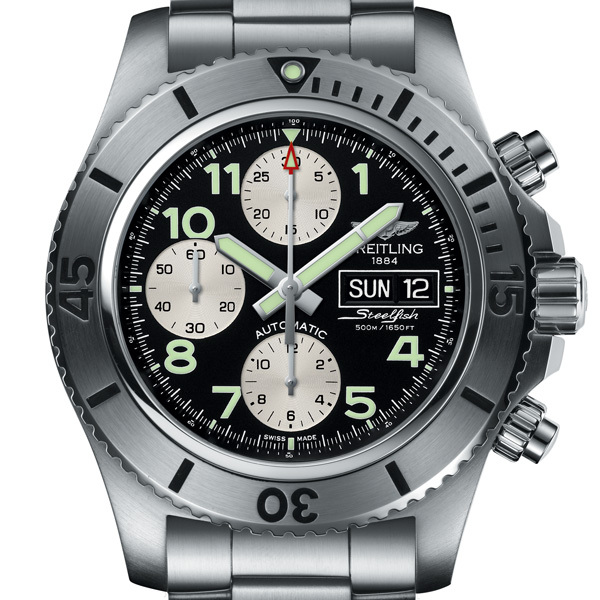 The case displays a satin-brushed finish on the top as well as polished sides; its sturdiness and its water-resistance to 500 m (1,650 ft) are enhanced by a screw-locked crown with protective reinforcements and by pushpieces that cannot be activated until they are unlocked. The large Arabic numerals and hands with a luminescent coating combine with a thick sapphire crystal glareproofed on both sides to guarantee optimal readability in all circumstances. 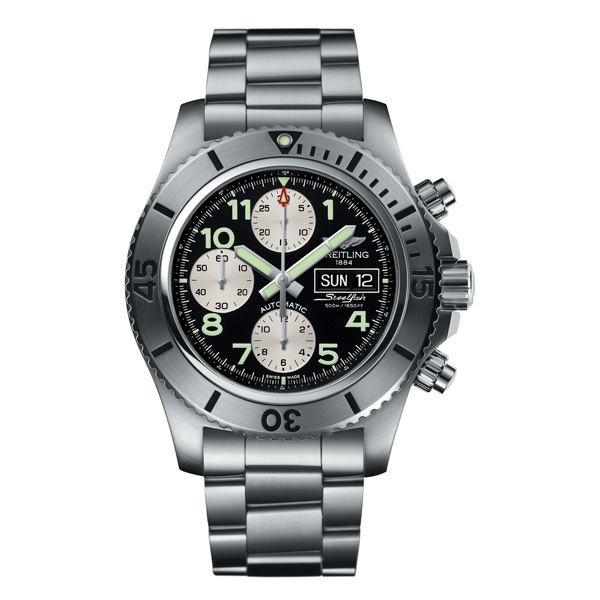 The Superocean Chronograph Steelfish special edition is available with a black, silver or blue dial and fitted with a steel bracelet or rubber strap. 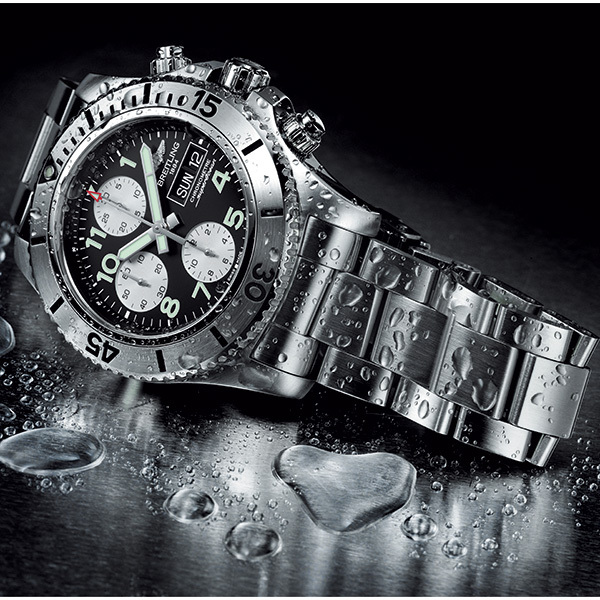 To preserve optimal precision come hell or high water, it is equipped with a selfwinding chronograph that is officially chronometer- certified by the COSC (Swiss Official Chronometer Testing Institute) – as indeed are all Breitling movements. Breitling Caliber 13, officially chronometer-certified by the COSC, selfwinding, high-frequency (28,800 vibrations per hour), 25 jewels. 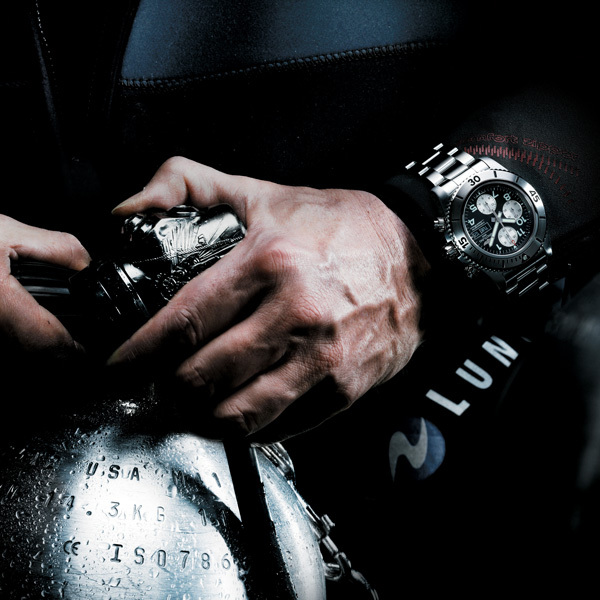 Water-resistant to 500 m (1,650 ft/50 bars). Volcano black, Mariner blue, Stratus silver. Ocean Racer rubber, Diver Pro rubber /Professional.